[Svenskt mönster här] This simple yet stylish (if I may say so myself 🙂 tank top is a quick and easy make using only basic crochet stitches (US crochet terms) and any cotton based sport or DK weight yarn. I used a lovely hemp-cotton-modal (rayon) mix from Danish brand Onion Knit. A premium yarn perfectly suited to all kinds of summer projects, it has a bit of roughness too it, giving it fantastic drape. However, it does come with a premium price tag, so you may be glad to know that any plain cotton yarn (e.g. Scheepjes’s Catona, Paton’s Grace, DROPS Safran, Phildar’s Phil Coton 3, Schachenmayr’s Catania, Rowan’s Cotton Glace) will also do the job. The top consists of a front and a back panel, worked from the bottom up and then stitched together at the sides. Finally, some finishing edging stitches and straps are crocheted. L: Top circumference c. 106 cm/ 42 inches, will fit chest up to 116 cm / 45 inches. Instructions for size L are in brackets, in blue, (like this). Why such a big difference between sizes, and why aren’t there more sizes? you may ask… Well, it’s to do with those neat diagonal lines meeting in the middle, and the resulting rather long pattern repeat. 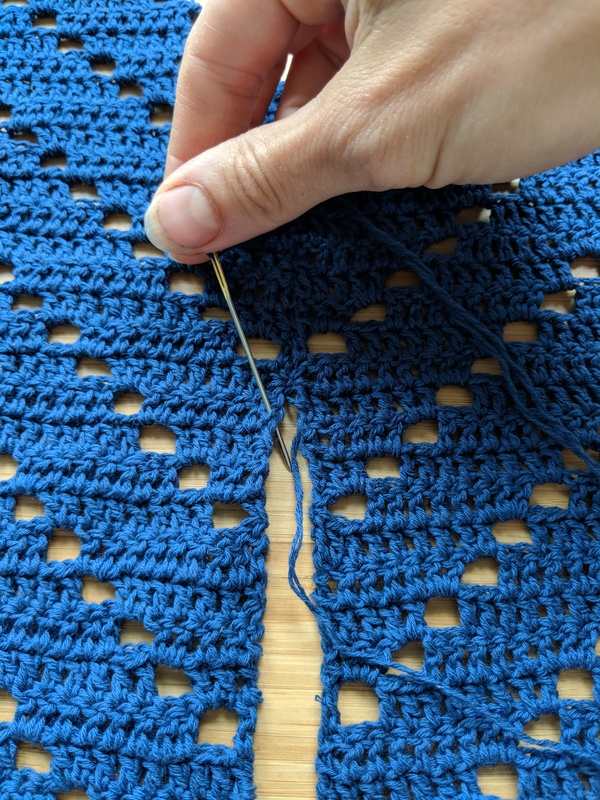 If you do want your top another size, I’d recommend experimenting with a different weight yarn and/or different hook size to get a larger or smaller gauge (and hence size). For instance, crocheting the S/M size with a worsted weight yarn and 5 mm hook may give you something that is in-between my two sizes above. 350m (383 yards) of sport or DK weight yarn (exact yarn weight doesn’t really matter as long as you meet gauge) for size S/M, c. 500m (547 yards) for size L. I used Onion Knit’s Hemp+Cotton+Modal in 402 dark blue. Read more about yarn choice above. Row 3: ch 3 (counts as first dc), dc in next 2 sts, 2 dc in next ch-sp, [ch 2, sk next 2 sts, dc in next 6 sts, 2 dcs in next ch-sp] 3 (4) times, ch 2, skip next 2 sts, dc in next 6 sts, ch 2, sk next 2 sts, [2 dc in next ch-sp, dc in next 6 sts, ch 2, sk next 2 sts] 3 (4) times, 2 dc in next ch-sp, dc in final 3 sts. Turn. Row 4: ch 3 (counts as first dc), dc in next 4 sts, 2 dc in next ch-sp, [ch 2, sk next 2 sts, dc in next 6 sts, 2 dcs in next ch-sp] 3 (4) times, ch 2, skip next 2 sts, dc in next 2 sts, ch 2, sk next 2 sts, [2 dc in next ch-sp, dc in next 6 sts, ch 2, sk next 2 sts] 3 (4) times, 2 dc in next ch-sp, dc in final 5 sts. Turn. Row 5: ch 3 (counts as first dc), dc in next 6 sts, 2 dc in next ch-sp, [ch 2, sk next 2 sts, dc in next 6 sts, 2 dcs in next ch-sp] 3 (4) times, ch 2, [2 dc in next ch-sp, dc in next 6 sts, ch 2, sk next 2 sts] 3 (4) times, 2 dc in next ch-sp, dc in final 7 sts. Turn. Row 6: (Row 6 is essentially the same as row 1) ch 5 (counts as first dc + 2 ch), sk next 2 sts, [dc in next 6 sts, 2 dcs in next ch-sp, ch 2, sk next 2 sts] 3 (4) times, dc in next 6 sts, 2 dc in next ch-sp, dc in next 6 sts, [ch 2, sk next 2 sts, 2 dc in next ch-sp, dc in next 6 sts] 3 (4) times, ch 2, sk next 2 sts, dc in final st. Turn. Work rows 2-6 five more times, ending with a row 5. Work one or two more repeats for a longer top. Bear in mind though, that cotton can grow considerably when blocked, and that the top will grow a bit lengthwise through wear as well. My top, pictured, is 39 cm (15.5 inches) from top of front to bottom edge, and 26 cm (10 inches) from armpit to bottom edge. Tapering row 1: (you should be at the end of a row 5, turn) ch 3, sk next 2 sts, [dc in next 6 sts, 2 dc in next ch-sp, ch 2, sk next 2 sts] 3 (4) times, dc in next 6 sts, 2 dc in next ch-sp, dc in next 6 sts, [ch 2, sk next 2 sts, 2 dc in next ch-sp, dc in next 6 sts] 3 (4) times, sk 2 sts, tr in final st. Turn. Tapering row 2: ch 3, sk next 2 sts, [dc in next 6 sts, 2 dc in next ch-sp, ch 2, sk next 2 sts] 3 (4) times, dc in next 10 sts, [ch 2, sk next 2 sts, 2 dc in next ch-sp, dc in next 6 sts] 3 (4) times, sk 2 sts, tr in final st. Turn. Tapering row 3: ch 3, sk next 2 sts, [dc in next 6 sts, 2 dc in next ch-sp, ch 2, sk next 2 sts] 3 (4) times, dc in next 6 sts, [ch 2, sk next 2 sts, 2 dc in next ch-sp, dc in next 6 sts] 3 (4) times, sk 2 sts, tr in final st. Turn. Tapering row 4: ch 3, sk next 2 sts, [dc in next 6 sts, 2 dc in next ch-sp, ch 2, sk next 2 sts] 3 (4) times, dc in next 2 sts, [ch 2, sk next 2 sts, 2 dc in next ch-sp, dc in next 6 sts] 3 (4) times, sk 2 sts, tr in final st. Turn. Tapering row 5: ch 3, sk next 2 sts, [dc in next 6 sts, 2 dc in next ch-sp, ch 2, sk next 2 sts] 2 (3) times, dc in next 6 sts, 2 dc in next ch-sp, [ch 2, sk next 2 sts, 2 dc in next ch-sp, dc in next 6 sts] 3 (4) times, sk 2 sts, tr in final st. Turn. Tapering row 6: ch 3, sk next 2 sts, [dc in next 6 sts, 2 dc in next ch-sp, ch 2, sk next 2 sts] 2 (3) times, dc in next 6 sts, 2 dc in next ch-sp, dc in next 6 sts, [ch 2, sk next 2 sts, 2 dc in next ch-sp, dc in next 6 sts] 2 (3) times, sk 2 sts, tr in final st. Turn. Tapering row 7: ch 3, sk next 2 sts, [dc in next 6 sts, 2 dc in next ch-sp, ch 2, sk next 2 sts] 2 (3) times, dc in next 10 sts, [ch 2, sk next 2 sts, 2 dc in next ch-sp, dc in next 6 sts] 2 (3) times, sk 2 sts, tr in final st. Turn. Tapering row 8: ch 3, sk next 2 sts, [dc in next 6 sts, 2 dc in next ch-sp, ch 2, sk next 2 sts] 2 (3) times, dc in next 6 sts, [ch 2, sk next 2 sts, 2 dc in next ch-sp, dc in next 6 sts] 2 (3) times, sk 2 sts, tr in final st. Turn. Tapering row 9: ch 3, sk next 2 sts, [dc in next 6 sts, 2 dc in next ch-sp, ch 2, sk next 2 sts] 2 (3) times, dc in next 2 sts, [ch 2, sk next 2 sts, 2 dc in next ch-sp, dc in next 6 sts] 2 (3) times, sk 2 sts, tr in final st. Turn. Tapering row 10: ch 3, sk next 2 sts, [dc in next 6 sts, 2 dc in next ch-sp, ch 2, sk next 2 sts] once (twice), dc in next 6 sts, 2 dc in next ch-sp, [ch 2, sk next 2 sts, 2 dc in next ch-sp, dc in next 6 sts] 2 (3) times, sk 2 sts, tr in final st. Fasten off. Is done the same as the front panel, but stop before the tapering. Here, I’ve got my front panel to the left and my back panel to the right. I’ve lined up the stitches and started sewing. Line up the stitches of the two panels, so they mirror each other. 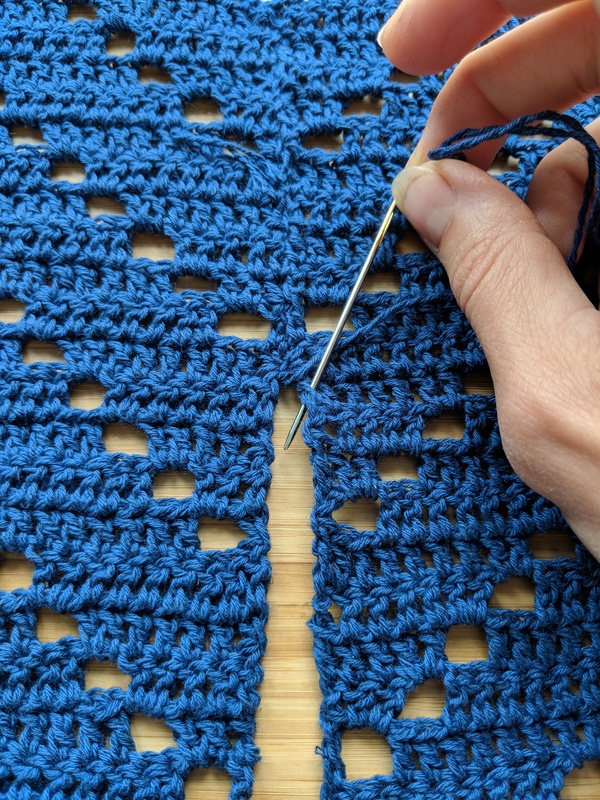 Now, using a darning needle and a long strand of yarn, stitch the panels together as shown in the photos below: first, insert the needle from right to left into the side stitch on the panel on your right, pull through. Then, insert the needle from left to right through the corresponding stitch on the panel on your left. Pull through. Continue like this, inserting needle from right to left and then from left to right, pulling through in-between. (But be careful not to pull too hard, as that may cause the fabric to pucker up.) This will give you a flat and invisible seam. Repeat for the other side. Fasten off the loose ends the same as you would normally do. Right side facing, attach your yarn at the right underarm, at the side seam. Ch 1, sc in each st across the back, working 2 scs into each ch-sp and 1 sc in each dc, until you reach the other seam at the left underarm. Now, as you continue up the tapered edge of the front panel, work 3 sc into each ch-sp and 3 sc around each tr. Once you get to the top left corner of the front panel, [ch 60, slst into one of the scs along the top edge of the back panel, roughly half-way between the middle of the back panel and the side seam, slst into the next st of the back panel, then slst into each of the 60 chs back to the front panel]. Sc in each st across the top edge of the front panel, at the top right corner of the front panel, repeat from [ to ] for the second strap, 3 sc into each ch-sp or tr down the tapered edge of the front panel, close with a slst to the first sc at the right underarm. Fasten off. You may also sc along the bottom edge of the top if you like, but that is entirely optional of course. This is such a pretty and wonderful design. I love this top! 😀 And I need to try this! Till now I crochet just jewellery, some decorations for home or carpets… Next step would be clothes made on crochethook. I’m sorry, I don’t really have the capacity to film tutorials… crochet design and pattern writing is ‘just’ a hobby for me 🙂 Perhaps you could get help from the group? Hello Anna, I love your patterns! I was wondering if you allow people to sell items made from your patterns?